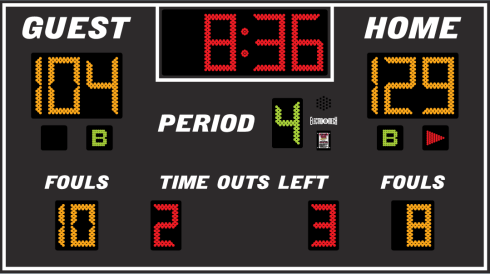 If your facility is 100% about basketball, then the LX2550 gives you 100% of what you need in a basketball scoreboard. We took the incredibly popular LX2655 design and swapped out the Player/Foul display for Time Outs Left. Our customers like this scoreboard's uncluttered look and the distinct use of red, amber, and green LEDs to form the digits and indicators. For extra impact, consider adding Electronic Team Names. You may also order a four-sided, center-hung version of this model.